Quebec photojournalist Renaud Philippe traveled to South Sudan in May 2017 to report on the situation in the war-torn and drought affected country. Thanks to on-the ground support from some of the Humanitarian Coalition’s member agencies, Renaud was able to access some of the most affected areas of the country. His stories and images highlight the characteristic resilience of people who through events outside of their control have been pushed to the brink of famine. Here’s a glimpse of the images and the experiences he captured. Nyakuig Kuong escaped to Nyal from Leer with her six children, aged 1 to 15 years old. 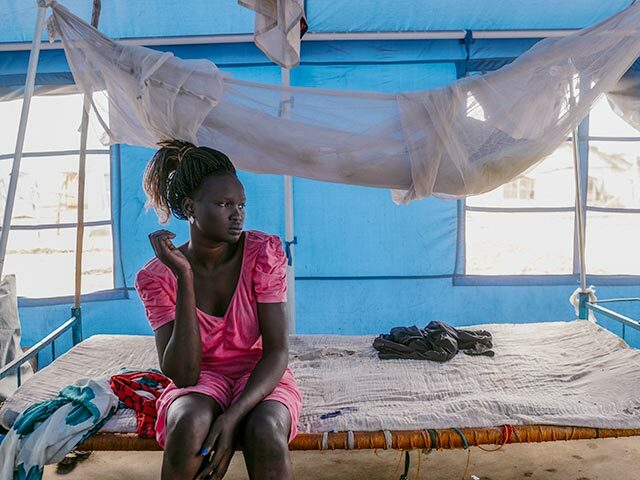 Nyariem Both with her son Machar, who was admitted to the Mankien health centre, managed by CARE. Machar is 6 months old and weighs barely 4kg. His mother traveled from Liengiere, 10 km away, for her son could receive care. A young girl sits on sacks of food, destined for more than 25,000 people in Mankien, a town in Unity State, one of the two states where famine was officially declared in February. On this day, CARE distributed more than 378 tonnes of food provided by the World Food Programme. With a burlap sac rolled out for a chair, a mother holds her child’s hand as they await their ration of food in Mankien.